Migrants’ rights are Human Rights! The extreme crises after a disaster and during forced displacements are a reality of millions of people around the world, everywhere. When the nature roars all people are affected whatever their capacities or their ethnic and social affiliations, but some are more affected than others because they got a severe injury in the catastrophe or because they were more vulnerable due their physical or intellectual capabilities. When humans make wars some people are more affected than others because of their ethnic and social affiliations, but those of them with disabilities are still often forgotten and their vital needs mistreated, as in Europe yesterday in Balkans and now in Ukraine, in Iraq, Syria, Palestine, Libya and in several places in the Middle-East and Maghreb, in Mali and Central Africa and in too much places from Asia and Americas. 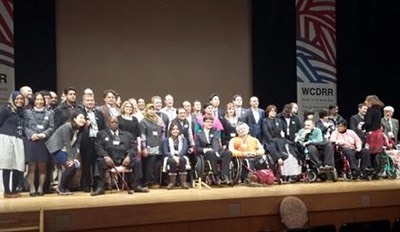 SENDAI, 18 March 2015 – ‘Inclusion builds resilience’ is the clear message from persons with disabilities to the Third UN World Conference on Disaster Risk Reduction. In the concrete, DPI Europe is fully engaged with the Council of Europe and the European and Mediterranean Major Hazards Agreement (EUR-OPA) to share knowledge with stakeholders of this program on the needs and resources of people with disabilities. Following this first participation DPI Europe has worked with 2 European teams of researchers on 2 proposals of studies on the disaster preparedness. The benefits for the sciences community will be to develop appropriate methodologies that permit to work effectively with people with disabilities, and a concrete implementation of the global objective of DPI as well as of the CRPD. By exploring different manners to communicate and to move, the collaboration with people with disabilities (by he fact with different abilities) will propose to the scientists to explore new territories and will conduct them to find solutions that they would not have developed without our participation. As the remote was developed in the 50th by Siemens for a quadriplegic person and as it is the case for a lot of technical innovations that are now used by everybody, the participation of people with disabilities will lead the stakeholders from the scientific communities to go further than if they had not been faced this type of situation. Because two persons facing the same restrictions develop different level of independence, the stakeholders who will work with people with disabilities who will intervene in the project, as trainers or witnesses, will also lead them to adopt procedures that reflect this diversity. As usual, challenges are numerous and technical management of such participation will be heavy during the 3 next years, but the subject and the objectives are essential and give us a marvelous opportunity to show and to demonstrate the value of our participation. Your experience of living with disabilities is needed. We need you become rescuers.